Growing number of voters favor Benny Gantz over Netanyahu as premier, while left-Arab bloc tops right-religious bloc in latest poll. Israeli Prime Minister Binyamin Netanyahu’s Likud party and its most likely coalition allies in a future government would fail to win a majority in the 21st Knesset if new elections were held today, a new poll shows. According to the poll, which was conducted by Midgam on behalf of Channel 12, the center-left Blue and White party continues to lead the Likud, with a projected 32 seats to the Likud’s 28 – two less than the Likud won in 2015. 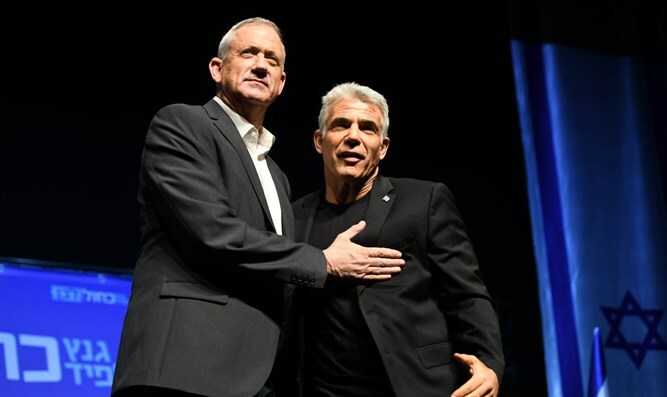 In addition, the poll found that Blue and White chairman Benny Gantz is closing the gap with Netanyahu personally as a candidate for Prime Minister, with Netanyahu now leading by just five points. When asked who they would prefer to have as premier, 39% of respondents chose Netanyahu, compared to 34% who said they favored Gantz, 18% who said they preferred neither of them, and 9% who had no opinion. The right-wing – religious bloc also has lost its majority in the 120-member Knesset, the poll shows, falling from 62 seats in the previous Midgam survey, released last Wednesday, to 59 seats, while the left-wing – Arab bloc rose from 58 seats to 61. While the Blue and White party remained stable since the previous poll at 32, the Likud inched up a seat, from 27 to 28. Labor, which won 19 seats (out of a total of 24 on the joint Zionist Union ticket) in 2015, would win just 10 seats, the same number the party received in last week’s poll. The far-left Meretz party held stable at four seats, a decline of one seat compared to the 2015 election. The United Arab List-Balad ticket also remained stable at four seats, while the Hadash-Ta’al ticket fell this week by one seat, from eight to seven seats. Former Yisrael Beytenu MK Orly Levy’s Gesher (Bridge) party passed the threshold this week with four seats, while it failed to cross the threshold in last week’s Midgam poll. The center-right Kulanu, which passed the threshold with four seats last week failed to cross the threshold in this week’s poll. The New Right and Union of Right-Wing Parties both received five seats, while the libertarian-leaning Zehut and former Defense Minister Avidgor Liberman’s Yisrael Beytenu party received four seats each in this week’s poll. Among the haredi factions, Shas gained a single seat this week, rising from five to six mandates – still a loss of one seat compared to 2015 – while United Torah Judaism remained stable at seven, an increase of one seat over 2015.